One can celebrate National Peanut Brittle Day on any day of the week and month, but that's too much, isn't it? That is why there is a special day for this candy – January 26. Brittle is considered as one of the first candy desserts ever made. There are different opinions how it appeared. One says, that the Irish liked eating sugarcoated peanuts. Later they started adding syrup to peanuts that evolved into a caramel bark. 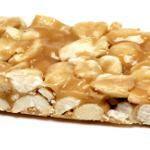 According to another opinion, peanut brittle was a Celtic dessert, who were covering nuts with sugar and baked them. Sugar melted, thus creating the first peanut brittle. Brittle is very popular in the USA, that is why National Peanut Brittle Day exists to honor this sweet treat. Try to make your own peanut brittle, but remember, that you will need a candy thermometer to regulate the temperature of caramel. By the way, don't cook brittle on a humid day, because candy won't hold it's shape. Tricky, don't you think so? If yes, then just buy peanut brittle in a nearby candy shop to celebrate the holiday.